is designed for today's salons and is guaranteed to provide years of trouble free service. 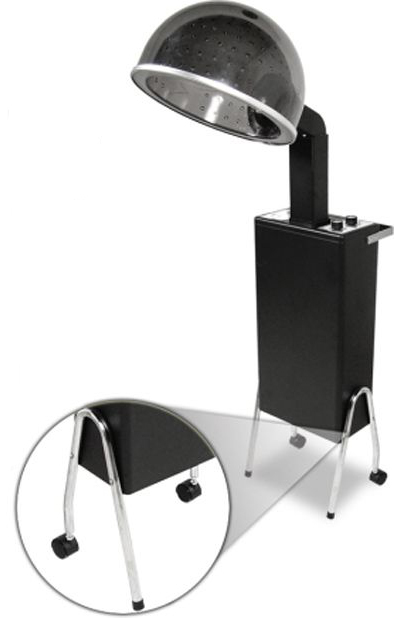 This is truly a hair dryer for the professional salon. Available only with a black cabinet. Features include adjustable jumbo smoke colored hood that is air-flowed engineered, single setting timer with automatic shut-off and two minute cool down period, infinite control thermostat for any temperature setting, ample heat for activating permanent waves, maintenance-free fan motor and heating element, easily accessible and washable filter, oven-baked enamel inside and out, and approval by Underwriter's Laboratory. The optional cart shown here quickly converts the Liberty to a portable drying system which can easily be moved around your salon.